How is everyone doing? Finally the weekend is almost here. We all love weekends don't we? 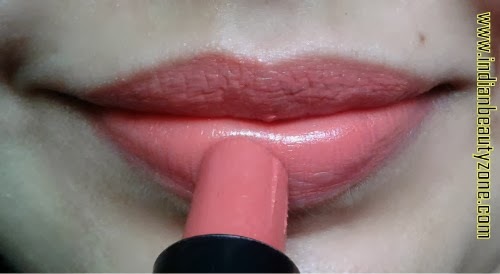 I am back this week with yet other lip product review this time, yeah a lipstick !! Don't blame me Radha sent me to review this.. Lol.. 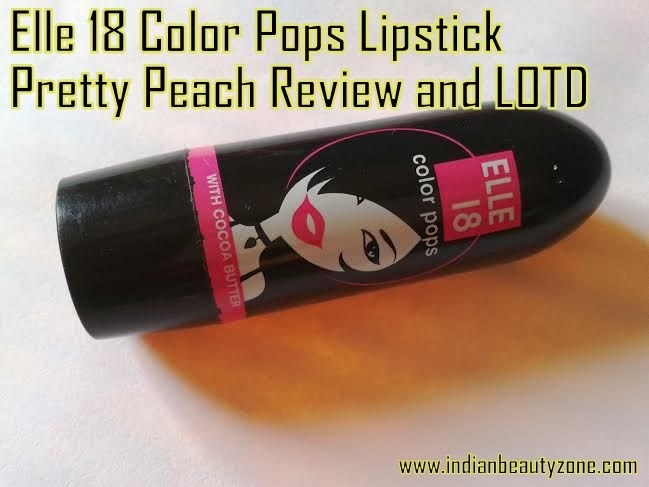 The lipstick I shall review is from the Elle 18 color pops collection called Pretty Peach. I love peach lipsticks hands down. So girls let us know more about this shade lipstick in my review below. Nothing mentioned except that it contains Cocoa Butter. As a brand Elle 18 has always been launching products which are fun and youthful and for the price everyone likes to grab a thing or two from their range. The lipstick comes in a very plain Jane plastic packaging. But the animated character on it makes it more appealing for one to get attracted to it especially the teenagers and young girls.The cap does not click lock but seems ok and does not come off that easily. Overall you cannot expect spectacular packaging for the price but its decent enough. 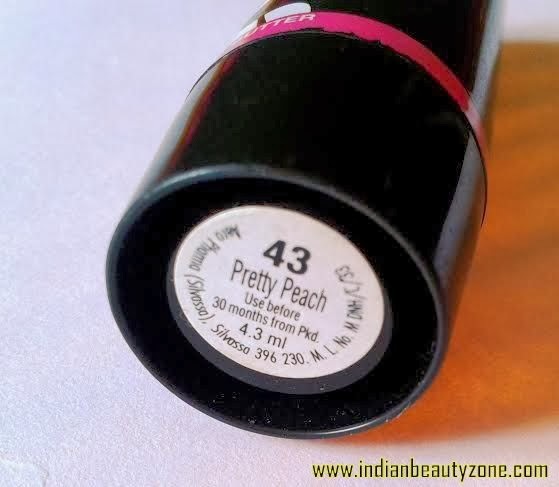 The lipstick as the name mentions is a peach color. Ok to be precise it is a Peachy brown with a hint of orange to it and I mean just a hint. In natural light it looks like a true peach color and in artificial lights a bit orange but nothing OTT (over the top). The best part is that it does not contain shimmer..Yayy!! The lipstick contains a lip balm in the centre of the lipstick which makes it extremely moisturizing and hence it glides like butter on the lips. The shade is pigmented enough but you would need 2 to 3 swipes to get a deep saturated color which I am completely ok with. I am in love with this shade. It is way too pretty and should suit most skin tones if you are looking for a natural lipstick. 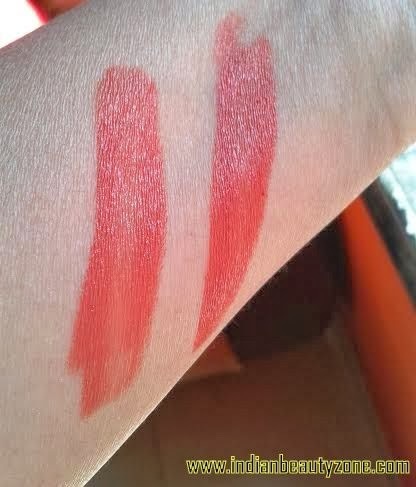 These lipsticks tend to break off at the bottom and also have a tendency to melt hence it is advisable to store them in a cool dark place or your refrigerator. I would say the lasting power is very poor due to the formula of the lipstick and one needs to reapply. The taste and smell may be an issue with some but I think it is ok and not that bad. Moisturizing and glides easily on the lips. Lasting power is not good at all due to its creamy nature. Has the tendency to melt. Overall I would say this is a very pretty Peach lipstick which should be a MLBB (My lips but better) shade for most skin tones. For 100 bucks one cannot expect much. So what you are you waiting for? Go grab one!!! philosopher at the same time very fun loving simple person who loves cracking one liners/jokes which come spontaneous to me. I am an animal lover especially dogs and cats. Do visit my blog too if you want to follow me and know me more. I also like this shade .but I don't know why is it not available .